The scriptures bear witness to and we are talking about the work of making Satan known. Consider these scriptures to lay a base for our discussion: 2 Thessalonians, Chapter 2, Verse 2,“In that day shall not come except there be a falling away first, and that man of sin be revealed, the son of perdition.” Verse 3, says, “And that wicked one shall be consumed with the spirit of God’s mouth on the brightness of His coming. ...” And, “God’s Coming,” the scripture teaches in Verse 9, “is after the workings of Satan.” We have something here that we really need to look deeply into. Now, “trees” don’t have knowledge of “good” and “evil.” This is a man who was taught “righteousness,” but also was taught the Teachings of his father Yakub—a System of Tricks and Lies; that he might master The Original People out of which he was brought. Satan knows that when you know him, you’re not going to love him. When you know him, you’re going to dislike him. Some will even hate him. But in the “falling away”: Once you get The Knowledge of Satan, once you get The Knowledge of his Divine purpose, once you get The Knowledge of his origin in the world, and how he became “Satan,” then you can “love him” or “hate him.” It’s irrelevant with God. Hate teachings … People don’t teach “emotion”; they either teach “truth” or “falsehood,” and an “emotion” can follow. You’re already “in love with Satan,” so you might still love him. But, The Truth of Satan will cause you to “fall away” from him, and then the Dislike of Satan will manifest. 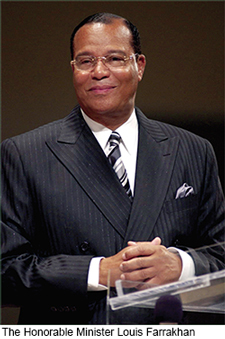 Let me address the Southern Poverty Law Center, which has put the Nation of Islam out to the world as a “hate group”: This is a predicate for evil that they intend to do to the Nation of Islam, and to me whose job it is to make Satan known. I have to do what God has commanded me to do and you have to do what you must do. But, are we really a “hate group?” Or is it that you hate the fact that your lying, your trickery, your deceit, your meddling, your snooping, your trouble-making, your mischief-making, your murder of the Human Family will be made known? Is the Nation of Islam really a “hate group”? Can you imagine Satan knowing that people are going to become aware of him: He started in Europe, where you cannot say “the Holocaust didn’t exist.” You can say “God doesn’t exist,” and there’ll be no penalty. You can curse God and there’ll be no penalty. But if you say “there is something wrong with the figures of The Holocaust”—if you disagree with the Jewish version of “The Holocaust,” that is considered a hate crime. And in some European countries you can go to jail for such—they are trying to do the same thing in America. Let us see who the real “hater” is! Let’s see who the real “anti-Semite” is! Since you call us a “hate group,” you’re going to have to prove it. The Truth is not hate; it’s either Truth or Falsehood. So, would you punish us for telling The Truth? Of course you would, if this is your world, Satan. But your “time” is up—your time to rule and deceive the people and the nations of the Earth is up. That’s why the scripture teaches His Coming is after the workings of Satan: You are in our time now, so you will never be successful in our time. You had your day of success in your time, and now God is interfering with your success because it is the Time of The End of your world and it is the Time of The Manifestation of God and Satan. Satan is referred to as “the son of the morning”: This is something to consider because “the darkest hour is just before the dawn.” And, as Jesus said in the Book of Revelation, Chapter 22, verse 16: “I am the root and the offspring of David, and the bright and morning star.” So Jesus rises at “the end of the night” of the 6,000 years of the Darkness of the Rule of Satan, leading man up into the Perfect Light of The Sun [“Son”], or The Light of God Himself. But Lucifer is rising with him! Remember, he is a “bringer of light,” so he, then, is competing with The Jesus Who is making him known. Lucifer, Satan is in competition: He is the one that weakened the nations. … But he cannot rise higher than Jesus, nor can he rise higher than the Morning Star that takes us right up into the Sun, like Venus; and gets lost in the Light of The Sun, so that you cannot tell one from the other. Just as when you see Venus, you are looking into the Light of The Sun, when you see Jesus you see The Father, for The Father is in him and he is in The Father. But this “Lucifer,” “son of the morning”: “How art thou cut down to the ground who didst weaken the nations?” Well, Lucifer, now you are contending with this Word. What a weak contention. … And to the three of you—Mr. Abraham Foxman [former National Director of the Anti-Defamation League, or ADL], Mr. Mark Potok [Spokesman and Director of Publications and Information for the Southern Poverty Law Center], and Mr. Harold David Brackman [author of the book “Jew on the Brain: A Public Refutation of the Nation of Islam’s The Secret Relationship Between Blacks and Jews”]: Your very weak answer to what we are saying only shows you have no “arguments” to defeat The Truth. So the only thing that you have is your power to misuse and to mislabel through your power with the media, your power with Black leadership, your power with Black preachers, your power with Black intellectuals, and your power with Black sports and entertainment figures. What is a “Semite”? According to the dictionary, a Semite is “a member of any of the peoples who speak, or spoke, a Semitic language”—but it then adds this to the definition: “including, in particular, the Jews and the Arabs.” That’s a rather “deceitful” definition—let us point out the deceit in that definition. Today we would like to enlighten you on whom the real “Semitic people” are, if you’re going to use that definition. “Anyone who speaks the Semitic language”: What is the “Semitic language”? You say it is Arabic and Hebrew, but let me ask you the question, “When did you learn Hebrew and Arabic, and from whom?” Certainly you are not The Original speaker of such language. The original people of that area are not White, the original people of that area are Black. And The Original Language of The Original Man is Arabic; and a dialect of that is Hebrew. So where did you get it? How did you get it? The 1st Chapter of the Book of Genesis opens with: “And the earth was without form and void, and God said, Let there be light, and there was light. And He separated the light from the darkness, and one part he called ‘day,’ and the other part He called ‘night.’” And then He goes on, and He creates. He’s not asking help from anybody; He just creates. Then in the 26th verse, we find weakness here: “And God said, Let Us make man after our image, after our likeness, and let Us give them power and dominion.” Well, that “God” is a little weaker than The God that created everything independent! What “God” is this that said, “And let Us”—not make another “God” as such, let’s—“make man, and make him in Our image, and after Our likeness”? The Honorable Elijah Muhammad said that The God that spoke like that is the Father of the White race; his name is Yakub. In the scripture he’s called “Jacob.” Not righteous Jacob; this is the “Jacob” that wrestled with the angel, and prevailed. And after he wrestled and prevailed, his name was changed from “Jacob” to Israel. How did you get here? By what process were you made? The Honorable Elijah Muhammad said you were grafted out of The Original Black Man. Your own scholars bear witness to this Truth. Your scientists are now agreeing with the Honorable Elijah Muhammad that Caucasian people are a new people on our planet; and they have brought their figures in line with The Teachings of the Honorable Elijah Muhammad: “6,600 years ago.” If that is so: Is that a teaching of “hate”? You said the thing that causes us to be listed as a “hate group” is our teaching on “Yakub.” My question to you: Can you, with all of your scientists, disprove what the Honorable Elijah Muhammad has said of you? 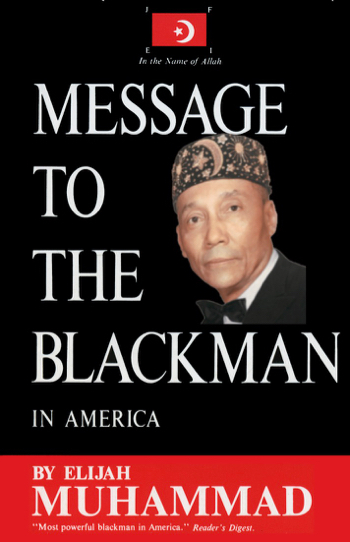 Please study the monumental book by the Honorable Elijah Muhammad titled Message To The Blackman in America, in the Chapter titled “Devil” beginning on page 100. There, the Honorable Elijah Muhammad teaches that Yakub saw the Brown Germ in the Life Germ of the Black man; a Black Germ and a Brown Germ. Yakub said that if he could separate that Brown Germ, he could drive it into its last stage, and clothe it with flesh, and give it form and expression—and that Mr. Yakub did. … Arabia is the Birthplace of Yakub, and it is where he taught the 30 percent who were dissatisfied to follow him. But the rulers of Arabia would not allow him to make his people on that peninsula, so they assigned him to the Island of Pelan, or Patmos, in the Aegean Sea. And there he took his followers, and the Process of Grafting “White” out of “Black” began. After you were made, you still had The Language. It is a Semitic Language, it is Arabic—you were speaking that Language. … Arabia was your home. But now you’re “a new creature”; and you go back into Arabia, and you start using some of the Tricknollegy that you were taught by your Father, Yakub. Within six months you had the Holy Land turned upside down. So the Honorable Elijah Muhammad said they started asking, “When did this problem arise among us, that they were causing us to fight and kill one another by telling lies?” You do the same today. Everywhere you go, you start pitting one against the other, telling lies, dividing and conquering. Those days are over. Now it’s your time to suffer the consequences of your evil. And even though there’s a chance for you to escape those consequences, because what you did was Divinely given to you to do and you have fulfilled your role, the Mercy of God is asking you if you would like to be a part of that which He makes new, or do you still want to fight God over your place? If you do, this is your end. Now it is time to look at how you, The Real Anti-Semite, have been anti-us: First, it is repugnant [“offensive,” “unacceptable”] to us that you would say that we are from “Ham,” one of the sons of Noah; or that you were from “Shem,” one of the sons of Noah. No. Noah wasn’t even in existence when we brought you out of us. This is why Pope John Paul II apologized to the Indigenous People of the Earth, because it was under that cross that you caused the pain and the suffering of the Indigenous People who came under the power of your rule. It was under your cross that we were enslaved. It was under your cross that you brought us out of Africa in The Trans-Atlantic Slave Trade—one of The Greatest Crimes against Humanity, against a Semitic People, if you will. The Real Anti-Semite: Your power was derived from slavery. Your power was derived from our production of cotton and tobacco, and the fruit of the ground that you used to become rich and powerful. Will The Real Anti-Semite please stand up? Some of your own scholars say you are not even connected to the land called Palestine. That you, the Ashkenazi Jewish people are Europeans; and the “Ashkenazi” name comes from the Hebrew language, which roots back to German. You didn’t speak Hebrew. You spoke Yiddish—a dialect of German. You came out of Khazaria; and you were the one that became a “convert” to Judaism. Now look at your behavior since you have taken land from the Palestinians who have been there: The lighter-skinned, the light Mestizo, or “White-looking” Palestinians: They’ve been there for centuries. They’re The Real Semites, too. Look at how you’ve treated them. The Sephardic Jews, the darker-skinned Jews: How are they treated in Israel? The Falasha Jews: How are they treated in Israel? They are persecuted. Look at what you’ve done to the Ethiopian women: You’ve absolutely tried to limit, with drugs, their birth ability, under a “Birth Control Law.” You tricked them into taking these drugs, or you would not even allow some to enter into Israel. You don’t even want the darker-skinned Jews in some of your schools. How dare you write us down as “the hater,” when your life in America, your life in Africa, your life in the Holy Land, is one of “segregation,” “separation,” “hatred,” “murder,” “lying,” and “stealing land from the original Palestinians”? Will the real “anti-Semite”—will the real hater please stand up? It is you, Mr. Foxman. It is you, Mr. Potok. It is you who masquerade as “The Chosen People of God”. You have stolen our identity. … And, now The Truth has come, and Falsehood must vanish. We are here to take back our identity. Who are you? I am not talking to those Jews who practice the faith of Judaism, I am talking to the so-called Jews who are Satanic. Look at what you’ve done to this country: We can show how you rule Hollywood. We can prove how you are the king of the media. We can show and prove that you own most of the publishing houses, that you own most of the record companies that have these Black rappers in their filthy language saying things against their Black woman, and glorifying a life of crime and drugs. You permit it. We can show, and prove, that in your “Hollywood,” you place us in such a degraded state that even in 2013 you had us acting like “Stepin Fetchit” and these figures of yesterday, making mockery of us. You use our women in film as though they are tarts! You know what you do! But it is for us to point out “The Footsteps of The Devil”—and to say to our people not to follow in those footsteps, for those footsteps are leading to perdition! You have to reject your father who taught you Tricks and Lies, and How to Master The Original Man, and submit yourself to God. Then if it pleases Him, He will make you, and us, into a new creature.